Motto: "To Cherish Our Past, To Plan Our Future"
Corona, originally named South Riverside, was founded at the height of the Southern California citrus boom in 1886, and is advantageously situated at the upper end of the Santa Ana River Canyon, a significant pass through the Santa Ana Mountains. The town of Corona was once the "Lemon Capital of the World." A museum there presents the lemon's former role in the local economy. The city derived its name (and its nickname, The Circle City) from the curious layout of its streets, with a standard grid enclosed by the circular Grand Boulevard, 2.75 miles (4.43 kilometers) in circumference. The street layout was designed by Hiram Clay Kellogg, a civil engineer from Anaheim who was an influential figure in the early development of Orange County. Corona was established as a town by the South Riverside Land and Water Company. The company was incorporated in 1886; founding members included ex-Governor of Iowa, Samuel Merrill, R.B. Taylor, George L. Joy, A.S. Garretson, and Adolph Rimpau. Originally a citrus growers' organization, it purchased the lands of Rancho La Sierra of Bernardo Yorba, and the Rancho Temescal grant and the colony of South Riverside was laid out. They also secured the water rights to Temescal Creek, its tributaries and Lee Lake. Dams and pipelines were built to carry the water to the colony. In 1889, the Temescal Water Company was incorporated, to supply water for the new colony. This company purchased all the water-bearing lands in the Temescal valley and began drilling artesian wells. Originally located in San Bernardino County, the city was named South Riverside and received its post office in that name on August 11, 1887. In 1893, South Riverside became part of the new Riverside County. 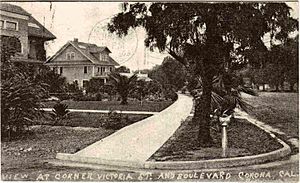 In 1896, the city was renamed Corona for its circular Grand Boulevard, where three international automobile races were held in 1913, 1914 and 1916. The city of Corona has been popular among celebrities drawn to its upscale areas and relative privacy compared to Los Angeles. Desi Arnaz spent time at their ranch, located in north Corona, and played golf often at Cresta Verde Golf Course in the northeastern section of the city. After their divorce, Mr. Arnaz continued to live in Corona. Corona has become a bedroom community for Orange County, Los Angeles, and the larger cities of the Inland Empire. The development of commerce and industry in the city has been accelerated by access to the area via the 91 Freeway, with many firms leaving northern Orange County to be closer to their employees' homes in Corona and Riverside. The construction of the nearby 71 Freeway has linked Corona to the Pomona and San Gabriel valleys. In 2002, the city government considered an initiative to secede from Riverside County and form an autonomous Corona County because the city government and some residents were dissatisfied with how services were handled in nearby areas. The effort was also considered by areas in other cities in the western part of the county as far south as Murrieta. Whether nearby cities such as Norco, California would have been included in the new county are unknown. The proposed county would have been bordered by San Bernardino County to the northwest, and by Orange County to the west, but it never came to fruition. Corona is located in the Greater Los Angeles Area. Corona is located at (33.8700, −117.5678). 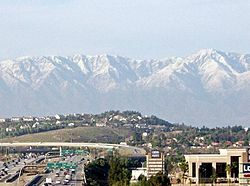 In recent years, there are talks to construct a proposed 10 mi (16 km) automobile and fast-speed train tunnel under Santiago Peak to connect Interstate 15 in Corona with Interstate 5 and the 55 Freeway of Orange County, to cut down on commuter traffic on the already crowded or high-traffic 91 Freeway. The 2010 United States Census reported that Corona had a population of 152,374. The population density was 3,914.0 people per square mile (1,511.2/km²). The racial makeup of Corona was 90,925 (59.7%) White (38.1% Non-Hispanic White), 8,934 (5.9%) African American, 1,153 (0.8%) Native American, 15,048 (9.9%) Asian, 552 (0.4%) Pacific Islander, 28,003 (18.4%) from other races, and 7,759 (5.1%) from two or more races. Hispanic or Latino of any race were 66,447 persons (43.6%). In the city, the population was spread out with 33.4% under the age of 18, 8.9% from 18 to 24, 35.1% from 25 to 44, 16.8% from 45 to 64, and 5.8% who were 65 years of age or older. The median age was 30 years. For every 100 females there were 98.0 males. For every 100 females age 18 and over, there were 95.6 males. South Corona is the newest and most upscale part of the city, and is located south of Ontario Avenue. Most housing stock was built between the early 2000s to the present, and ranges from suburban neighborhoods to custom built mansions in the foothills. This area has the highest rated schools in the city (as well as some of the highest in the region) and is known for being very clean, homogeneous, and well maintained. It is primarily upper-middle class and upper class income levels. Sierra Del Oro is the western portion of Corona, comprising the neighborhoods situated along Green River Rd, extending all the way towards the 91 freeway and the Orange/Riverside county line. This area holds many apartment complexes geared towards commuters. The Corona Auto Center is located at the base of the foothills. In December 2016, construction of the Foothill Parkway expansion was completed, allowing a direct street link between Sierra Del Oro and South Corona. Temescal Valley, California is an unincorporated but census-designated area in Riverside County at the southernmost end of Corona city limits, and is included in the city's sphere of influence. It includes the neighborhoods of Sycamore Creek, Trilogy, The Retreat and Horsethief Canyon Ranch. As of 2013, the City of Corona has applied for annexation of the area through the Riverside County Local Agency Formation Commission (LAFCO). On September 26, 2013, the Commission formally denied the City of Corona's request for annexation. The contract between Corona and the County to provide its emergency services to the northern-third of Temescal Valley persists. Although the arguments of the opponents of annexation included the fear of being "Coronians" and losing the area's identity, Temescal Valley's ZIP Code remains associated with Corona, CA. Home Gardens is a Census Designated place within the City of Corona's sphere of influence. The neighborhood is largely populated by Hispanic and Caucasian communities. Home Gardens is one of Corona's largest neighborhoods with a population estimate of approximately 12,000 residents. It is also one of the city's lowest income areas. The neighborhood is served by Magnolia Avenue, a major thoroughfare which leads into the City of Riverside. Bus service is served by the Riverside Transit Agency (RTA) and Corona Cruiser. Riverside (SR 91) freeway interchange with Chino Valley (SR 71) in western Corona. 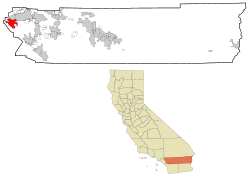 Corona, California Facts for Kids. Kiddle Encyclopedia.